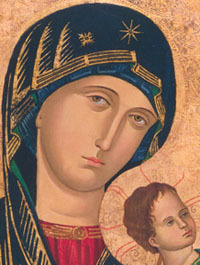 Our Lady is clothed in the colors of virgins (red) and of mothers (blue). These are also colors of royalty. The star on Mary’s veil reminds us she is the dawn announcing Jesus’ coming.